I have been looking at the Lindisfarne Gospels over the last few weeks in the British Library, before it goes to its brilliant summer exhibition in Durham. 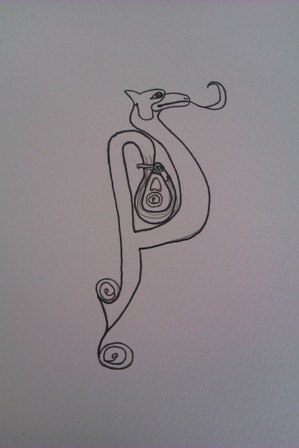 On the page that is open, within its glass case, is a letter ‘P’ shaped like a dragon. It made me think of difficult emotions I have separated myself from, which I have imagined to be dragons. I have kept myself from experiencing them with a glass wall of separation. Mindfulness helps to bring down that glass wall of separation, whether it is our body, thoughts, or emotions that we have separated ourselves from. One of the other things that kept me trapped was the thought that I had to be strong, and not show vulnerability and so it was hard for me to tell someone else I was struggling. But as I practiced mindfulness I had to face the difficulties and experiences I was keen to avoid. That can seem overwhelming. At that moment it is really helpful to let someone else in, a wise friend, a doctor, a counsellor. When I did that I was able to face the difficult thoughts and emotions and begin to name them and draw them accurately. They began to lose their power, and began to dissolve. I am trying to draw this Lindisfarne dragon. It has such complex plaited interlace, initially I think I can’t recreate it. But the more I pay attention to it, the more its pattern begins to make sense and not seem overwhelming and beyond my mapping. I believe we can do a lot to help ourselves. But the most important lesson I have learnt is to let others in to help us with our vulnerability. The dragon drawing isn’t finished yet.